"Why do we bother to interview artists? Why expect them, in two hours, to tell us their story, or - what we're really looking for - a story that will dovetail with the work, explain it? The better the artist, the harder it is to produce such an accounting, for the life has been more fully transformed. Why violate their privacy, brush aside their years of work - the labor of creating stories that are not their story?" KIRA OD: Born 1960, New York City. Self-taught. About 5'-3" with enough hair to cover a nine-week-old Chihuahua, but not enough to keep it warm. Has a depraved sense of humor which is only exacerbated by caffeine. Real talent is imitating animals, which once won her an all-expense-paid trip to the San Diego Zoo. Would have stayed, but the spare cages were full. In desperation, she went home and became a sculptor. This is the woman your mother could not possibly have warned you about. In spite of these idiosyncrasies, her work is in private collections in the US, Canada, the UK, and Poland. 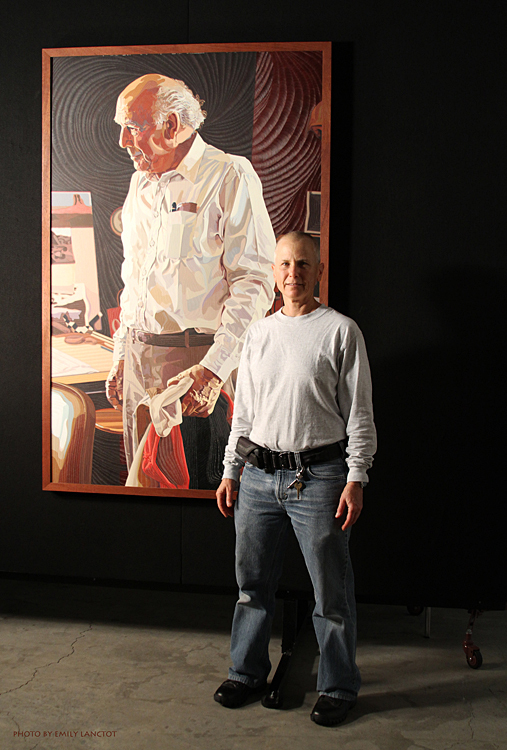 Her Mr. Olympia Medal is part of the permanent collection at the American Numismatic Association's Money Museum in Colorado Springs, CO; and her painting, John Lautner: Portrait of an Architect (seen here), is in the permanent collection of the DeVos Art Museum in Marquette, MI. Try that without the help of a gallery or agent! Now go back and look at the art, you nosy little web-surfing monkey.